I am very excited to announce the addition of Dr. Steven Miao to our growing family here at Funtastic Dental and Orthodontics. 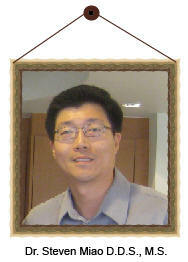 Dr. Miao will be caring for our orthodontic patients starting in November. He comes to us with years of experience in the Pediatric and Orthodontic fields of dentistry. As promised, we will be adding more days to our schedule to accommodate our current families and new ones we haven’t had the pleasure of seeing. I look forward to seeing all of you soon and have the pleasure of introducing Dr. Miao to our wonderful patients. I have been telling Dr. Miao that we have The Best Patients in the World. He can’t wait to meet each and every one of you! It’s no big secret that children require fruits as part of a balanced diet. If you give your children a few fruit options to choose from, it will make them more likely to eat one of the options. Also, take your children with you to a local farmer’s market or the grocery store where they can see the variety of delicious, colorful fruits available and allow them to choose the one they would like to try. Demonstrate to your children that fruits can be just as delightful as candy or cookies for dessert. Consider a fruit parfait for dessert, or a fruit smoothies topped with fruit balls. Your children are more likely to eat fruit when it is easy and accessible to them. Consider keeping the fruit on a kiddie table, and make sure they are cut into small enough pieces that children can easily grab them and go. Lastly, keep in mind consuming more fruits can assist your child on their cavity-free journey. Whenever possible trade a candy treat for a fruit treat, and let us know how that worked at your child’s next dental visit. We love to give recognition to our new friends. Here are the new patients that became members of our practice family this past October. We’d like to welcome you publicly & wish you all the best. Brian Anderson, Dylan Aulenta, Levi Brown, Lauren Carr, Nikka Coetzee, Kacie Comstock, Christian & Olivia Davila, Diana Dimare, Emily Felix, Abrianna & Matthew Fournier Jr., Alexander Germanilo, Kylie Hebert, Jullien Ibarra-Barrios, Kailani & Kale Jacolbia, Kayla & Krista Koontz, Audrey Kranson, Nayla Lee, Brandon Lopez, James Louie, Mia Magana, Beya & Eva Meza, Ella Mims, Sofia Mojarro, Noah Pacheco, Lily Packer, Niya S. Perkins, David Sanchez, Thommanon Thach, Zoe Thomas, Owen Vanderberg, Emma & Wyatt Williams, and Blake Wolff. We’ve heard that the best thing for diaper rash is fresh air. Have your child go without a diaper for awhile. You can even lay a cloth diaper underneath baby when he/she is taking a nap. Make sure you keep checking and if the diaper gets wet and replace it with a dry one. We’ve also been told you can try tea bags. Place 3 or 4 tea bags into the diaper at diaper change. When he/she pee’s, the tea bags release a certain chemical that helps in the healing of diaper rash. It may turn his/her bottom brown but the rash will be gone within 24 hours. There’s been talk that oatmeal works wonders and is a healthy alternative for diaper rash. Before bathing your baby put some oatmeal in the water and stir in. Don’t have oatmeal? You can put two tablespoons of baking soda into the babies bath water. Mix it in until it is all dissolved. Soak your babies bottom in it for at least 10 minutes every day. Some of the moms at the office say to try using the milk of magnesia. Each diaper change pour milk of magnesia onto the rash. Should work quick and you should notice difference with the next diaper change. Vegetable oil is something else we’ve heard. After a bath, making sure the diaper area is completely dry, rub plain vegetable oil in both your hands and rub into the babies bottom. Do this with each diaper change. Lastly, we recently heard to try some cod liver oil capsules. Cut the tip off of about 4 and pour the oil onto your babies rash and rub it in. If the rash is only small you may need to only use 1 or 2 capsules. Let us know on facebook, FUNtasticDental, if you’ve tried any of the above or if you have any of your own that are not listed. We love to hear all about natural remedies for our patients and their families. These toothbrushes are designed to make brushing your teeth fun, Brush Buddies’ exclusive Justin Bieber dentistry products encourage children and teens to brush properly while enjoying their favorite pop and R&B tunes. Plus, each toothbrush is designed with a soft, replaceable DuPont bristle head for gentle cleansing, and is coated in soft rubber for improved grip. 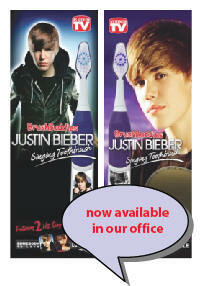 Join the Bieber brushing revolution by adding a high-quality Justin Bieber singing toothbrush to your brushing stations at home! Now is the time to think about “Open Enrollment” for Dental Insurance and it is also the time to prepare your Flex Spending Accounts for the coming year. Most businesses have the month of November as the time to make changes to your dental plan that will become effective in January. Often, we find that people seem to think they know what they have signed up for, only to find out they wished they had chosen the other insurance for their orthodontic needs. Sometimes this mistake can delay treatment for a full year. We would like to help you in making the best choice. 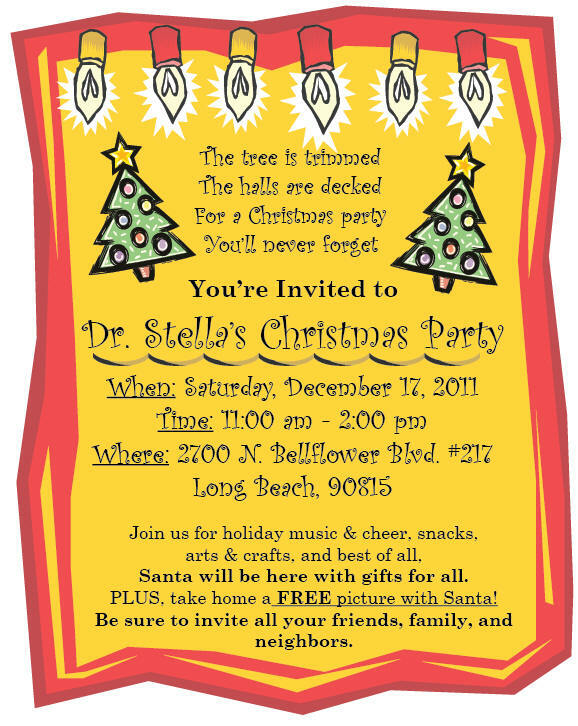 Please call the office now, (562) 627-8800, for your FREE orthodontic exam. At this appointment Dr. Steven Miao (our incredible new orthodontist) will do a complete exam and let you know if treatment is recommended. Also, Veronica or Zulma (our incredible treatment coordinators) will go over your expenses to help you prepare your finances and insurance choices. In addition, having an orthodontic exam before January 2012 can help prepare you for your medical and dental taxed free savings known as Flex Spending Accounts or Cafeteria Plans. Tell a friend too! They would be grateful that you reminded them about their benefit. Thanksgiving is just around the corner – 24th of November being the precise date. It is one of the most anticipated holidays of the year. Thanksgiving is associated with many foods and the best part is that not only are traditional Thanksgiving foods delicious; they are nutritious and great for your teeth. The traditional foods such as sweet potatoes, pumpkin pie, and cranberries help prevent tooth decay and gum disease because they are a great source of cavity-fighting vitamins and minerals, and hence lead to good dental health. Below is a great recipe for Thanksgiving that we acquired from simplyrecipes.com. Try it and let us know what you think on our facebook page FUNtasticDental. Place the potatoes and salt in a pot and fill the pot with cold water until the potatoes are covered. Bring to a boil over high heat, then bring the heat down to low and simmer for 15-20 minutes or until a fork easily pierces the potatoes. Drain the water from the potatoes. Place the butter in a small saucepan over low heat and brown the butter. The butter will foam for a bit before calming down. When the butter turns to a light amber color watch for it to turn to a nutty brown (this can happen very quickly). Immediately take off heat. Add the chopped sage to the butter (it may cause some foaming). Pour over the potatoes. Add the goat cheese chevre, and milk and mash the potatoes with a potato masher until smooth and all ingredients are well incorporated. Salt and pepper to taste and serve immediately. “On Thanksgiving Day, like any day, brush your teeth, avoid foods filled with sugars as best you can, and don’t snack often– and if you do, brush your teeth again,” says Dr. Stella, and “Have a Happy Thanksgiving Day!